Are you a mom or are you going to be a new mom soon? A Sam’s Club membership is a must have for moms, particularly new moms! Check out the baby and toddler section at Sam’s Club! Every day low prices on everything needed for babies & toddlers, including diapers, food, toys and gear. Feel free to include a deep link to the Baby & Toddler category page on Sam’s Club. Your unique affiliate deep link to that category page is included above. 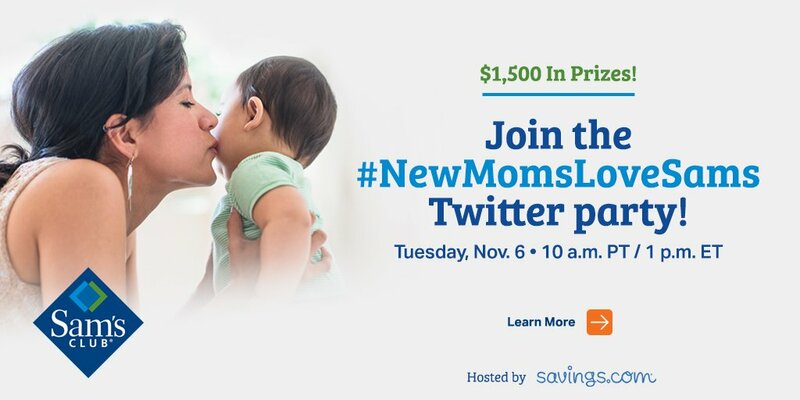 Join the #NewMomsLoveSams Twitter party on Tuesday, November 6th at 10AM PT/1PM ET. They’ll be talking about all the ways that a Sam’s Club membership is beneficial for new moms! There’ll be $1500 in gift card prizes up for grabs, so be sure to RSVP to be eligible to win! While you are here, enter the Savings.com’s Sam’s Club membership gift card giveaway. Twenty Five (25) winners will receive a $100 Sam’s Plus Gift of Membership Gift Card.